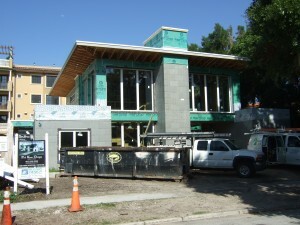 On August 6 the Residential Green Building Advocacy (RGBA) committee toured two adjacent homes in Winter Park being constructed by Phil Kean Designs, Inc. The location is extremely close to Rollins College and Lake Virginia as well as to Park Avenue. The first home was rebuilt after demolition of a small building, and the second built on what had been a parking lot. The second home, described in detail here, will be on display as the 2012 New American Home for the International Builders Show, February 8-12. At 4,200 square feet on an in-fill site, the home is a far cry from earlier homes built for the IBS and shows how sustainable design is becoming more and more sought after if not yet mainstream. Kean’s design is a re-interpretation of the Classic White Box of the 1960s and ‘70s, honoring architecture of the past while taking advantage of current technologies and design trends. Not only the design but details like manufactured stone imitate the style of Frank Lloyd Wright and other great architects. At the same time the latest green building products and methods are included into every aspect of the home’s design. Like all showcase homes for Builders Shows, the home benefits by materials, fixtures and appliances being donated by manufacturers who wish to display their products. The home is to be certified under the National Green Building Standard (NGBS) process administered by the NAHB Research Center, at “Emerald,” the highest of the four levels in this rating system. The home will be certified LEED for Homes, targeting a Platinum level. It will be also certified FGBC, Energy Star, Florida Water Star, and Florida Yards and Neighborhoods. Its all-native landscape will be endorsed by the Florida Native Plant Society. The home will use no actual turf but a small area of artificial turf. Its Insulated Concrete Forms (ICF) walls were noted to have not only the construction ease and insulation features generally mentioned, but also to insulate from outside noise. Engineered wood was used heavily throughout, and it was commented that engineered wood floors were not only less costly than real hardwood but actually more stable. The structure of the building was designed to shade the western side. Daylighting was an important feature, and to prevent the large areas of glass from becoming hot, screens were designed for the south and east sides of the buildings. The screens are controlled by an automated system and come up as the sun shines directly on the window in the morning. While automatic, these and other controls can be overridden through commands from a PC or even an IPad. Lighting includes flourescents and LED cans. These all have dimmers, and lights in bathrooms are on motion sensors. In the lofts, solar tubes contribute to lighting. Dual-flush toilets and other low flow fixtures are used throughout. Solar thermal water heaters deliver heated water in addition to the “on demand” system. Water heating efficiently utilizes a manifold design. Photovoltaics (PV) are dedicated to run the AC fans with others to create electricity that feed back into the grid reducing the home’s electric load. The PV is of the new type of integrated laminate solar panels, mounted on GAF TPO roofing. HVAC for this size home with its insulation and other features was designed at 6 tons. Air conditioning units are LG mini-split and Lennox Systems. The windows are operable to let in outside air. The builders cautioned about the problem of bringing in humidity from outside. Dehumidifiers will be used. The home includes many types of automatic controls, in addition to the window screens. A special room above the loft area provides a central location for these controls. Among the systems is an indoor fire-sprinkler system. For Indoor Air Quality, there is an exhaust fan in the garage, and zero VOC paint and low VOC water-based stains were used. No open flames were allowed, and an induction range was chosen over a typical gas range, to avoid gas odors. A central VAC system contributes to Indoor Air Quality features (and points on the rating systems). The home has a “mud room” entryway to prevent dirt from entering the house. RGBA Chair Aaron Barcelona asked: What items cost the most over your typical way of building? Kean answered that the ICFs are more expensive. The screens and automated system for daylighting controls were also expensive. However, rewards for all of the green features will definitely outweigh any extra costs for the new homeowner, according to Kean. Rainwater harvesting was considered, but currently the City of Winter Park does not allow cisterns to be buried. As for earning points for certification: The location being close to bus lines, shopping and other facilities allowed important points to be earned. A difficult situation was presented in that Kohler Co., donating the toilets and other plumbing fixtures, wanted to showcase their latest products. These had not yet had time to be certified under the EPA’s WaterSense program, which product certification is required to earn certain water efficiency points. This made the builder have to work harder to secure other points. 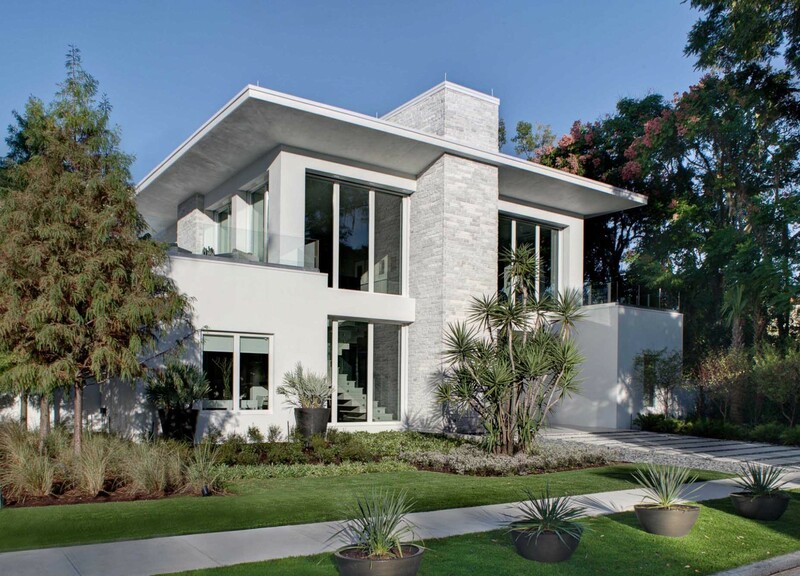 Whether the home achieves LEED Platinum or not, the RGBA committee was delighted to tour this spectacular home and looks forward to seeing it when completed. Congratulations to Phil Kean Designs, and thanks to Phil and construction managers Keith Groninger and Marc Krebs for the tour.